VIDEO: Woman Throws Shoe At Hillary Clinton; No Harm Done : The Two-Way The flying footwear missed the former secretary of state and potential 2016 presidential contender. She was giving a speech in Las Vegas. "Is that part of Cirque du Soleil?" Clinton joked. Hillary Clinton was not struck Thursday when a woman threw a shoe at the former secretary of state while she was on stage in Las Vegas giving the keynote speech at conference hosted by the Institute of Scrap Recycling Industries. "What was that, a bat? Was that a bat?" Clinton said moments after the footwear flew by. She then turned to humor. "[Was] that somebody throwing something at me? Is that part of Cirque du Soleil?" Clinton joked. "My goodness, I didn't know that solid waste management was so controversial. ... Thank goodness she didn't play softball like I did." December 2008: President George W. Bush ducks as a shoe flies by during a news conference he was holding in Baghdad with Iraqi Prime Minister Nouri al-Maliki. According to The Associated Press, "Brian Spellacy, U.S. Secret Service supervisory special agent in Las Vegas, said the woman was being questioned and would face criminal charges. Spellacy declined to identify the woman, and he said it wasn't immediately clear what the charges would be. A black and orange shoe was recovered from the stage, Spellacy said." The AP has video of the incident here. Clinton, a former senator and former first lady, made a bid for the Democratic presidential nomination in 2008 and is widely expected to run for the White House again in the 2016 campaign cycle. As the AP notes, Thursday's shoe-throwing incident is reminiscent of what happened to then-President George W. Bush in December 2008. 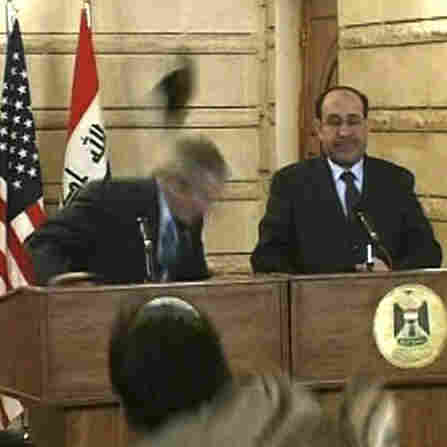 Bush was holding a news conference in Baghdad when an Iraqi journalist hurled two shoes at him — an act considered to be an insult in Arab cultures. Bush dodged the projectiles.